6 Nations 2019 is coming... Book your table now! Sack off the line at the bar, pre-order your food and drinks and we got the rest. Miss none of the action. Book Your Table! Join us for Superbowl 2019! FREE ENTRY Open til late Hot food served throughout Book your table now to get a good spot! Book Your Table! Cause Fish & Chips deserve to have their YAY day - meet St Aldates Tavern's FRIYAY's!!! Every Friday, ALL DAY long grab your significant other, best pal, sister or brother, a colleague or a boss (? ), cause we treat those who walk in pairs with 2 Fish & Chips for a YAY price - £19.95! Book Your Table! Join Frank and us here at St Aldates for the last Friday of every month - with an evening of live jazz. Following from our Gin and Jazz Night earlier this month Frank and his friends will be joining us every month, downstairs in our main bar for an evening of beautiful music, good beer and laughs. Book Your Table! Mothers Day Food n Fizz! Bring the Muma along to St Aldates on 31st March 2019 for all day special set menus, tasty home cooked food and a free glass of pink fizz for the Muma. Book now to avoid disappointment! Book Your Table! Amir Khan will take on Terence Crawford on the early hours of 21st of April and we WILL BE SHOWING! 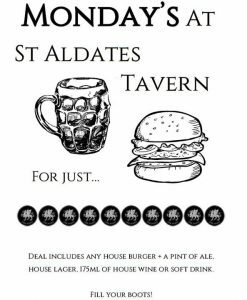 Don't miss out on the LIVE action and come to St Aldates Tavern! The following fights have been confirmed for the undercard: - Felix Verdejo vs Bryan Vasquez - Shakur Stevenson vs Christopher Diaz Teofimo Lopez vs Edis Tatli Ring walk of main event is expected at 03:00 UK time on 21st of April.